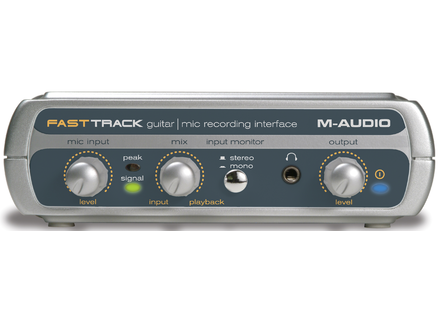 Fast Track, USB audio interface from M-Audio in the Fast Track series. Product replaced by the M-Audio Fast Track MKII. Avid M-Audio say they've updated the Fast Track recording interface with better sound quality, new features and a new version of Pro Tools software. The new version is Pro Tools M-Powered Essential— designed to simplify the music creation process while providing the same platform the pros use. They say you can simply plug in your instruments and you're good to go. Fast Track offers phantom power so you can use studio condenser microphones like the M-Audio Nova. Fast Track is compatible with most music recording applications from GarageBand to Pro Tools M-Powered, and includes Pro Tools M-Powered Essential recording and effects software so you can start making music immediately. No pricing info, but you'll find more on this page. Native Instruments Balinese Gamelan Created in collaboration with sound-design house Soniccouture, Balinese Gamelan offers an assortment of ethnic instruments for classic Indonesian music, for use in film scoring, electronic music production and traditional compositions. Celemony Melodyne Assistant & Essential 2 Celemony has announced two new products: Melodyne assistant, which offers the Melodyne technology for the editing of vocals and monophonic instruments, and Version 2 of the bundle edition Melodyne essential, which now runs as a plug-in in the Pro Tools environment and improves Version 1. Flux Syrah Dynamics Processor Software Described as a "Creative Adaptive-Dynamics Processor", it is designed to adapt to the music and to the beat of the material.